Love and Life at Leadora: Would you like succulents with your turkey? Would you like succulents with your turkey? I have this little funky cabinet in my kitchen which I store canned goods. I needed to primp it up a bit, and I immediately thought "succulents"! Lucky for me, I have a free source for succulents (thank you, my dear mumsie! ), so all I needed now was a container. I told the kids, "I'm off to the GoodWill!". 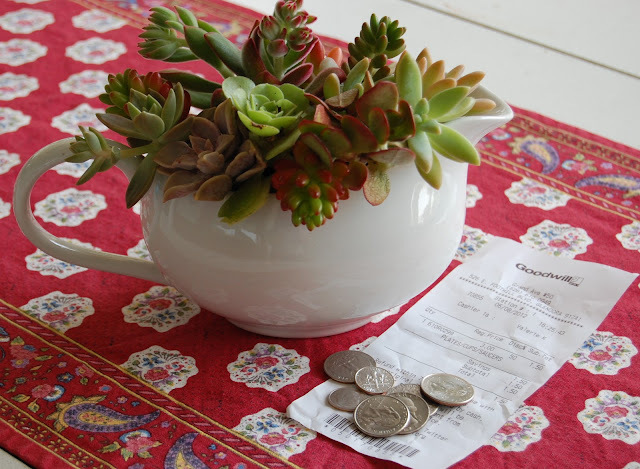 A gravy boat makes a lovely succulent container. Your kitchen remodel is really coming together nicely. I'm sure you are tired, but wow. It's going to be fantastic. Oh...that gravy boat is so cute and what a steal! I love the succulents in it. 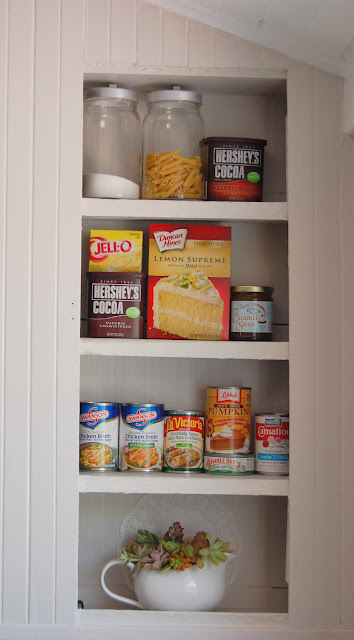 It adds a special touch to the cabinet. As someone who has seen the kitchen remodel I can say it is fabulous! I love your gravy boat and your kitchen sink. Sometimes you have to wait for the good things......but waiting is so hard. I struggle with growing indoors so I am always impressed with such nice arrangements. Your farmhouse style sink is beautiful. I love the gravy boat/planter! I think a kitchen remodel always take about ten times longer than you think it would. I'm really liking the gray cabinets! I want to paint my cabinets gray and that is the nicest color I have seen.. what exactly is the brand and color.. thanks..
Hi Becky! The paint color is Martha Stewart's Bedford Gray. Hey, Heather. Tyla here. For some reason I cannot comment on your back splash post but I wanted you to know that I think it looks fabulous!!! I know you must be very satisfied. It really is beautiful. the plants and containers are wonderful...but the kitchen!!! what do you see out the window over the sink? Okay. I admit it. I'm jealous of your farm sink! Maybe I could get one for Christmas this year. :) And you really are like my mother ... she likes succulents too! What a wonderful blog you have! Thanks for sharing! Looks lovely and don't you just love Goodwill! So many great finds there. It's amazing how good plants look in pitchers. I was going to buy flower plants but I think I'll just use pitches instead.